Results: Real Estate Consultant January 2018 Board Exam (List of Passers, Topnotchers, Performance of Schools) - Balita Boss! 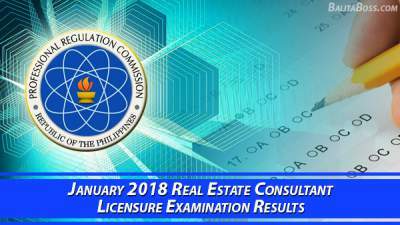 The Professional Regulation Commission (PRC) released the official results of January 2018 Real Estate Consultant Licensure Examination on Wednesday, January 17, 2018. The examination was conducted by the PRC on December 17, 2017 (Written) and January 9-12, 2018 (Revalida) in the city of Manila. A total of 30 out of 40 examinees passed the January 2018 Real Estate Consultant Board Exam, according to PRC (via PRC Website). JONATHAN JOHN GARCIA MALDUPANA, a graduate of SAINT LOUIS UNIVERSITY, ranked first in the January 2018 Real Estate Consultant Board Exam with a rating of 83.10 percent. To download the January 2018 Real Estate Consultant Board Exam Topnotchers, click here. To download the January 2018 Real Estate Consultant Board Exam List of Passers, click here. To download the January 2018 Real Estate Consultant Board Exam Performance of Schools, please click here or here. The Board of Real Estate Service who administered the Real Estate Consultant Board Exam are Dr. Eduardo G. Ong, Chairman; Florencio C. Diño II and Rafael M. Fajardo, Members. From January 19 to January 22, 2018, registration for the issuance of Professional Identification Card (ID) and Certificate of Registration will be done on-line. Please go to www.prc.gov.ph and follow instructions for initial registration. The date and venue for the mass oathtaking of the successful examinees in the January 2018 Real Estate Consultant Licensure Examination WILL BE ANNOUNCED LATER, PRC said. During the last examination conducted last March 2017, a total of 31 out of 44 examinees passed the Real Estate Consultant board exam, PRC announced. MARIA LOURDES SUYANG DEIPARINE topped the March 2017 Real Estate Consultant Board Exam with a rating of 83.60%.